London Calling: unique selection of products based on vintage finds, all with a London theme, includes embroidered cushions inspired by our framed Vintage Routemaster destination stops. London Bus route cushions. Bring a hint of iconic London to your living space with this embroidered Battersea Riverside cush..
Embroidered Cushion 55/45 Linen/Cotton Mother of pearl buttons to fasten 68 cm x 32 c..
Embroidered Cushion 55/45 Linen/Cotton Mother of pearl buttons to fasten 68 cm..
55/45 Linen/Cotton Black/Off White 84 cm x 36 cm Duck Feather Inner Pad (not included for.. 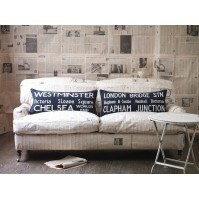 This gorgeous embroidered cushion will bring a perfect hint of iconic London to your living space.. This gorgeous embroidered cushion will bring a perfect hint of iconic London to your liv..
55/45 Linen/Cotton Black/Off White 84 cm x 36 cm Duck Feather Inner Pad (not i..
55/45 Linen/Cotton Embroidered Font CREAM/OFF WHITE 85 cm x 36 cm Dry Clea..
55/45 Linen/Cotton Embroidered Font WHITE 85 cm x 36 cm Dry Clean Feat..